Is Captain Miracle catholic? Or is he some kind of mishmash of Christian denominations? 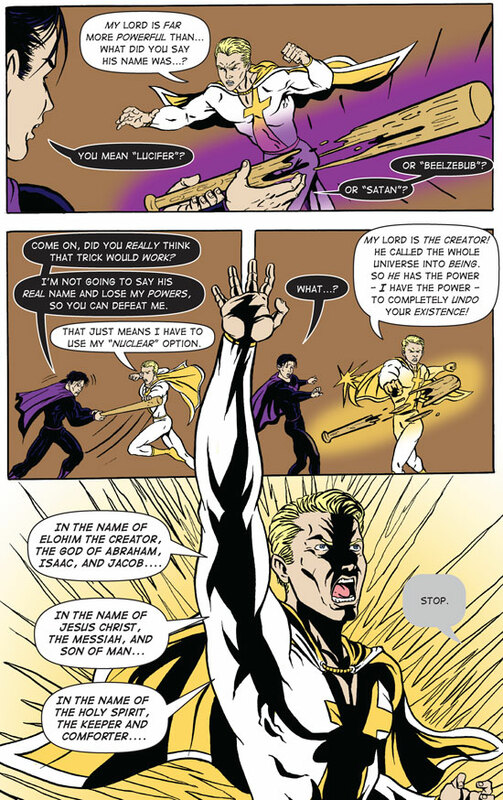 Billy was raised Roman Catholic, but Captain Miracle answers directly to God, so he’s simply “Christian”… not Protestant, Catholic, or any other denomination. Ah. That would explain the Trinity. Just one more question: Will Yeshua feature in this comic or is that to close to home, so to say? Oh, yes, I had forgotten about the Aborted Jesus story. Archives... Epilogue Cold War Camp David Before the Beginning Jurisdiction Dispute Shade of Gray The Nuclear Option Negotiating with Terror Miracle vs. Anti-Miracle Miracle meets his match Anti-Miracle The Weight of Responsibility The Lazarus Option Sodom Al-Mohammed You Can Hide But You Can’t Run Scene of the Crime To save the town, it became necessary to destroy it Blind Reason Spitting on Providence Miracles of Science The Religion of Science Debate Won and Mission Accomplished Take a Walk on the Water Side Beach Wailing A Mission From God The Tetragrammaton Dark Alley Meeting In the Beginning Captain Miracle is coming!